We are mathematical beings. Our very survival as animals on the planet has depended upon us being able to think logically, to recognize patterns, to make educated guesses, and to imagine. These are mathematical ways of knowing that come from a deep understanding of one’s surroundings and its rhythms. In a Montessori classroom we develop keen mathematical minds through specialized equipment that allows the brain to make profound connections. We surround children with math and geometry. Much like an immersion language experience, math is taught in a Montessori environment in a manner that allows for deep and conscious work. One has to pay attention. The concrete materials that we employ resonate with children because they are meaningful, and the work that involves them is purposeful. 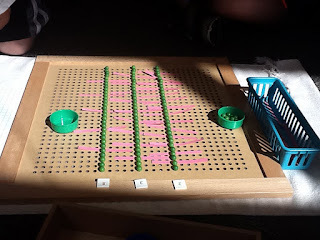 When a child uses a Montessori math material they activate a multi-sensory battery of skills that demand that child does not merely calculate. Rather, a child has to think. It is fairly easy to produce functionally literate mathematicians in a school setting. Students can memorize facts and can be shown formulae; they can be taught how to think linearly, and move from one concept to the next. What we do here, however, is to teach with the whole brain in mind – to develop an understanding of math and geometry that allows children to know and understand.